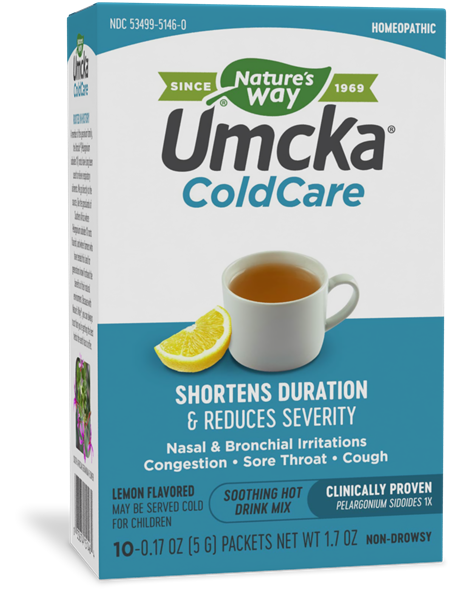 Umcka ColdCare Lemon Hot Drink / 10 pkts/bx - Nature's Way®. The right natural extract addresses the cause. Why Umcka ColdCare Soothing Lemon Hot Drink? When you’re suffering with cold symptoms, sometimes the best remedy is a hot, soothing drink. Cupping your hands around a steamy mug of Umcka ColdCare Soothing Hot Drink leaves you feeling relaxed and recharged. Sipping on this delicious drink will shorten the duration and reduce the severity of cough, congestion, sore throat, nasal and bronchial irritations. The drink may also be served cold for children. Dissolve contents of 1 packet in 4-6 ounces of hot water and sip while hot. May also be dissolved in 4-6 ounces of cold water, which may be preferable for children. Adults & children 12 years of age and older: take 3 times daily. Children 6-11 years of age: take 2 times daily. Sore throat warning: severe or persistent sore throat for more than 2 days or if accompanied by a high fever, headache, nausea, vomiting or rash may be serious. Consult a physician promptly.